Two of my favorite things in the world are craft beer and books. On the last Thursday of every month I pair a book I love with a pint to sip while reading it. If you’re celebrating Thanksgiving today, I hope your day is full of all your favorites, as well! 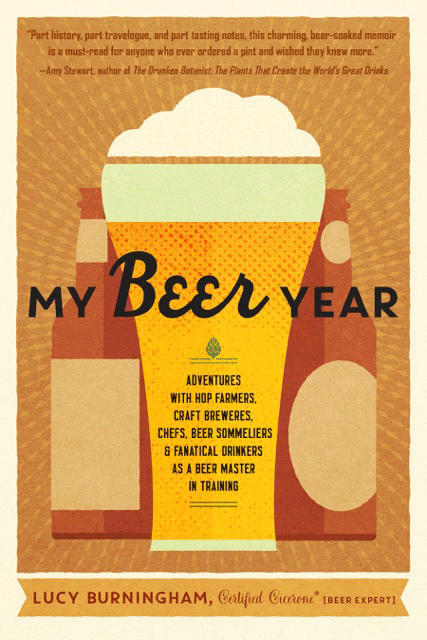 I’ve mentioned before that I’m mostly a fiction reader, but that when I do pick up non-fiction it typically has close ties to food (aka, the delicious memoir)– so you can imagine my excitement when I heard about Lucy Burningham’s new book My Beer Year. Because you know if anything gets me more excited than food, it’s beer. The premise behind the book is that Burningham, a journalist who has written extensively about craft beer, decides to study to take the test to become a Certified Cicerone. If you’re familiar with the concept of a sommelier in the world of wine– someone who is able to identify styles by taste and know the history of a particular type of wine while also suggesting a food pairing– then think of a Cicerone as this to the world of beer. In My Beer Year, Burningham shares the details of her journey to the exam, from visiting hop farms, to attending the Great American Beer Festival and traveling to Belgium to cleaning beer lines at a local brew pub.